"And it was all motherf***in' Yellow"
Chris Martin and Jay-Z have been rollin' together for some time, and now the Coldplay frontman has revealed that the hip-hop superstar is to guest on Lost!, a track that he and his band plan to release in "a few weeks". In a handwritten note on the Coldplay website, Martin also confirms that the four-piece are to put out an EP in November called Prospekt's March. The singer explains that this contains "eight tracks that were not finished back in May (our deadline for Viva La Vida) but that have just been completed". The Prospekt's March EP will be available as a download, and also as part of the Viva La Lida: Prospekt's March Edition album that's set for release (presumably in November, too). What isn't exactly clear is whether the Lost! 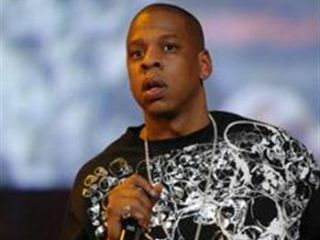 song that Jay-Z will guest on is the same as the Lost+ track that is listed on the EP. What's also odd is that Martin's letter is dated October 08, which is actually tomorrow. Maybe he's been hanging around with Doctor Emmett Brown recently, too.